Are you feeling ready to buy a house? You might want to hold off on real estate and invest that money in gold and silver instead. 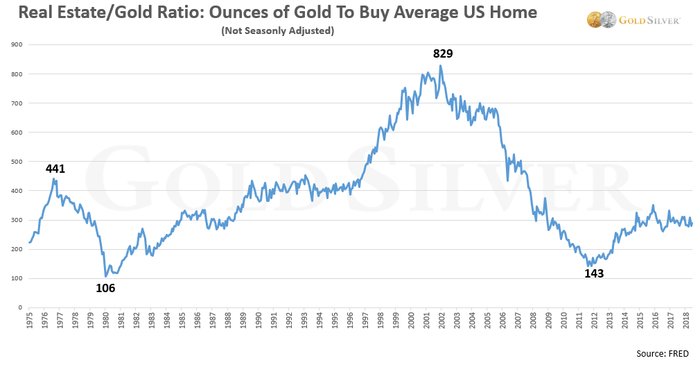 Because if historical trends are any indication, we’re approaching a time where those with enough ounces of gold or silver can skip the mortgage and go straight to the sale. Real estate prices look to be topping out — and the current bubble may be even bigger than the one that led to the 2008 collapse. Meanwhile, gold and silver prices are back at 2010 levels as both real estate and stocks continue to surge. As the relative pricing of these two assets reverses over the coming years, it will afford those with a meaningful holding of precious metals the opportunity to buy a house outright. That may be a bold statement, but it’s based on the historical relationship between these two asset classes. They tend to be (though are not always) inversely correlated, so as one gets overvalued you tend to find the other one undervalued. Outside of the stock market, real estate prices have of the strongest inverse correlations to the price of gold and silver. Here’s the historical relationship between the price of the average U.S. home and the price of an ounce of gold since 1975 (house price divided by gold price). The highs and lows are marked. You can see that, at gold’s most recent peak in 2011, it took only 143 ounces of gold to buy the average-priced home in the U.S. And when gold previously peaked in 1980, it took a mere 106 ounces. If real estate is indeed topping out — there are reports that both sales and supply are reversing — and you accept even half of what Mike Maloney thinks is ahead, then property should be sold now and gold bought. This is especially true if you live in the global cities that have been identified at the most at-risk of the real estate hyper-bubble. Then wait for the ratio to reach an extreme low and swap back. That “extreme low” likely won’t occur until the real estate/gold ratio falls below 100. That’s because unlike the 1970s, most major asset classes are in a bubble today, something history has rarely witnessed. The global financial system is much more precarious now, particularly when you include widespread money printing that wasn’t present then. And debt loads are at all-time highs for most segments of society — government, corporate credit, global credit, student loans, auto loans, derivatives and unfunded liabilities for both federal and many states. Add it all up and it is hard to imagine a scenario where gold and silver do not soar in the upcoming fallout. So yes, a gold/real estate ratio below 100 is not just possible but probable. Can you picture buying a house for 100 ounces of gold — barely more than six pounds? I can. But it’s not gold’s ratio that has my mouth watering — it’s silver. Here’s the historical relationship of silver and real estate since 1975, also with the highs and lows marked. You can see how extreme the readings have been, which is due to silver’s higher volatility than gold. 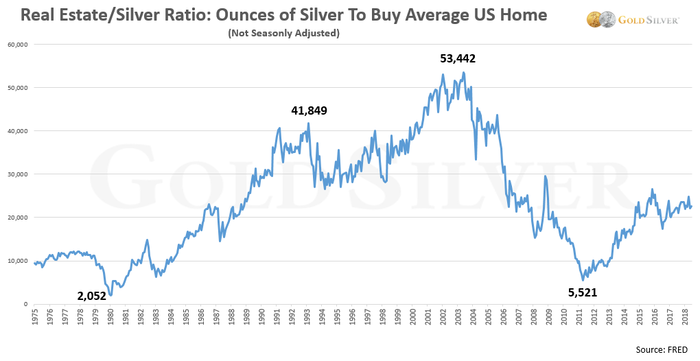 We’ll use that volatility in our favor, as a repeat of just 2,052 ounces of silver to buy a house (as was seen at its peak in 1980) is highly likely. As with gold, though, the ratio will probably drop even further in the type of crises we see ahead. So yes, four monster boxes of silver could indeed buy you an average-priced home at the bottom of the cycle (before taxes). That’s an amount even those with a modest budget can handle. I’m personally itching to buy some real estate. Partly because I’m not getting any younger, partly because I want a vacation home and partly to build a family legacy. I’m guessing that buying a house is something on many reader’s minds as well. And let’s face it, real estate is also a real asset, and has the added advantage over gold that it can produce income. In other words, gold is not a substitute for real estate. This is before you even add in the other good reasons for owning a home — peace of mind, having pets, the pride of owning a space — that has nothing to do with finances. But for the near-to-medium term, the likely price trajectory for real estate is down, and for precious metals, it’s up. So for now, I remain focused on accumulating more and more metal so I can capitalize on the ratio reversal when it happens. And I like the advantages gold has over real estate. How many of these would be beneficial to you? Gold is portable; land and houses are immobile. You can’t pick up your house and move it elsewhere; gold travels well. If local taxes or regulations impact your real estate investment negatively, you’re stuck. If I’m worried about these things with my gold, I can move it elsewhere easily and quickly. Gold doesn’t require maintenance; real estate does. Houses and buildings require new roofs, toilets and paint. All I have to do with my gold is keep it safe. A real estate investor can deduct “depreciation” on their tax return, but that’s because stuff wears out and you have to repair or replace it. Gold, in contrast, has very low maintenance and carrying costs. Pay a small fee for professional storage and you’re set. Gold has high liquidity; real estate has low liquidity. Selling a piece of real estate takes time, effort, expense and usually outside help. If you need the cash quickly, you’re out of luck. With gold, you can liquidate in one day — or in just three minutes if you have an online storage account. Gold is divisible; real estate is not. You can’t sell half your house if you need some cash, but you can sell half your gold stash. You could get an equity line on your house, but you have to apply, be approved, wait for it to be set up and then request the cash. Meanwhile, I was able to sell half my gold holdings while you were reading this. Gold has superior tangibility. Houses can burn down, but my gold coins and bars can’t be destroyed by fire, water or even time. Heck, the gold from a 200-year old shipwreck just needs to be wiped off. This makes gold an especially attractive asset to leave to your heirs. Gold is more value-dense. I can hold $50,000 worth of gold in the palm of my hand. I can store a quarter-million dollars’ worth in a safe deposit box. Gold can be private and confidential. If I want, I can keep my gold and silver out of sight from nosy neighbors and other prying eyes. Not so with real estate. Gold requires no specialized knowledge. Real estate requires research, on-site visits, appraisals, inspections and usually the help of a broker, all at an expense. All you really need to know for gold is to buy high-quality bullion, avoid rare coins and store it someplace safe. Done. Gold is cheaper! As the charts above show, gold and silver are significantly undervalued compared to most real estate around the world. The opportunity available today is not in the property market but in precious metals. Silver has many of the same advantages over real estate as gold. The bottom line is that measuring your housing purchase in ounces of precious metals will be more than worth the wait. The fine print here is that you sell near gold and silver’s peak, and that you pay the tax on the gain from another source. Do those two things, though, and the home is free and clear. And history also indicates a seller’s market could come around again that you can capitalize on. There aren’t many investment certainties in life. But much lower ratios in gold and silver compared to real estate come pretty darn close. Is a home or vacation property on your radar? 100 ounces of gold or 2,000 ounces of silver now, plus a little time, and you could very well get there.